In occasion of the anniversary of the 1966 flood of Florence that had worldwide resonance due to its massive damages to buildings and priceless works of art the Firenze Committe 2016 promoted the international conference "The 50th anniversary of the flood in Firenze del 1966. A different anniversary” on the state of art on hydro-geologic risks due to floods where the results of decades of studies and latest projects have been presented to the world. Now a volume published by Firenze University Press collects the outcome of such efforts: Saving a World Treasure: Protecting Florence from Flooding. The works have been produced by ISTC (International Technical Scientific Committee), lead by Jerry G. Galloway (University of Maryland), and resulted in a wealth of in-depth information, solutions and measures to manage flood risk to help keep world treasures safe from future flooding. Another important contribution to raise the awareness of this key issue affecting the town of Florence is the new Flood Documentation Center set up in the main branch of the Humanities Library, in piazza Brunelleschi. Its aim is to give access to the documentation collected under the Toscana Firenze 2016 Project in addition to the one available in digital format at other institutions, to support the dissemination of knowledge and to promote collaborative initiatives with other institutions. Here, collected in one portal, technicians, scientists and the public alike can access a wealth of information about past flooding events in Florence and all technical solutions adopted as well as state-of-the-art technology available for prevention and management of disasters. As part of the same memorial celebrations the exhibition "Bellezza Salvata" (Rescued Beauty) was set up in Palazzo Medici Riccardi from November 2016 to March 2017 to showcase and celebrate all the amazing work that followed in the wake of the flood of 4 November 1966 when waters rose up to 6 metres above street level. At the time Palazzo Medici Riccardi in via Tornabuoni, a stone's throw form the Arno river, was the seat of the Medici Museum that got heavily damaged both in its structure and contents, along with many other buildings and treasures situated in the areas adjacent to the river banks. 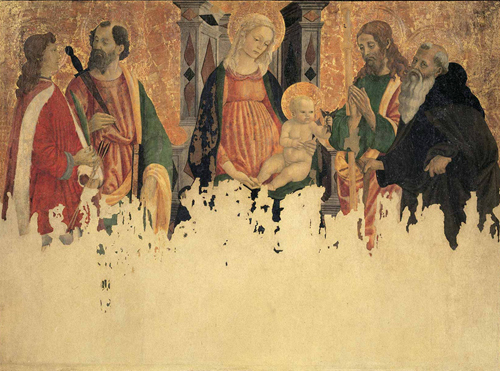 The event had such worldwide resonance that it sparked a tremendous response of solidarity from the international art community with donations and a great number of restoration specialists coming to Florence to help restore the priceless works of art to their original splendour. This painstaking work took 50 years to complete in its most conspicuous part and the exhibition is a testimony of it. Such fascinating testimony is now widely accessible in a virtual exhibition thanks to the contribution of the Library System of the University of Florence which curated, designed and implemented the online exhibition Rescued Beauty - Florence 1966-2016.